I have been exercising 3 times a week with a group of friends for nearly 4 years, and I hate it, but I also hate to miss a session. Our ages range from 60 to 85. We meet at 7:00 a.m. on Monday, Wednesday and Friday and have hired a young man as our "personal trainer". He varies our workouts and continues to challenge us and keep us on our toes - literally. 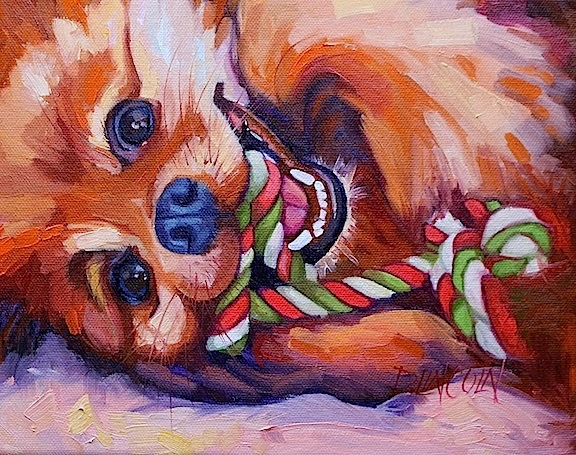 As a Christmas gift for his adorable (new) wife, he commissioned me to paint portraits of their two little dogs. This is one of them. Since I was once owned by a Pomeranian, I really enjoyed doing this one for him. Tomorrow, the other cute doggie. Today was beautiful and I spent part of it getting ready for some extended cold, wet weather. We moved a large round bale of hay to the cows, bedded down the calf pen with dry hay, filled all the water tanks and made sure the chickens were dry. Bring it on, Old Man Winter - we are ready! Genesis 8:22 As long as the earth endures, seedtime and harvest, cold and heat, summer and winter, day and night, shall not cease.